The Benevolent and Protective Order of Elks have always known that the molding and educating of our youth will continue to secure our heritage. Because of this, Elks spend much time and effort in working with your people. 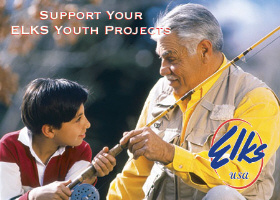 Over ten million teens and pre-teens participate in Elk-sponsored events like the National Free Throw (Hoop Shoot) Contest, Campfire Girls, Boys Clubs and more than three thousand youth baseball, football and basketball teams. Lodge facilities in hundreds of cities and towns serve as youth centers. Club rooms are used for dances, entertainment, meetings, hobby shows and other organized activities. Many of the Elks State Associations own and operate their own camps. Every summer thousands of boys and girls, who normally don't have opportunity for this type of constructive activity, benefit by participating in these camps. The Elks National Foundation, the major philanthropic endeavor of the Order, annually awards over two thousand college scholarships to deserving young men and women. These grants are given regardless of race, creed or national origin based on need, scholarship and leadership. The first week in May, each year, is Elks National Youth Week. During this time, an observance is held recognizing these young people for their achievements and contributions to their community. Youth Week programs traditionally feature student government days, essay and poster contests, junior fairs, parades and other entertainment. In many communities, the highlight of the week is the award presentation to winners of the annual "Most Valuable Student" Contest. Every year, the Elks National Free Throw (Hoop shoot) Contest continues to grow. Over three million boys and girls between the ages of 8 and 13 compete annually. The national finals are held at an NBA professional basketball game in Indianapolis, Indiana in April. The names of the winners are inscribed on a plaque in the Naismith Basketball Hall of Fame in Springfield, Massachusetts. One of the strongest activities in Elkdom has been the Drug Awareness Program. Hundreds of Lodges sponsor their own clinics, seminars or workshops to inform adults and educate the young people. The program is specifically aimed at preschool and primary grades. The goal is to get these children in their formative years and impress upon them the danger of this cancer on our society. For information about our Youth Activities program, contact Dino Castronova (732-528-5582), for more details.